The oldest cliché in rock is the casualty list. There are the high-profile heroes of misadventure: Buddy Holly, Hendrix, Stevie Ray Vaughan. There are those that couldn’t handle success and took the ultimate way out: Nick Drake, Kurt Cobain. But perhaps saddest of all are those huge talents who unaccountably chose simply to fade into obscurity, often in self-imposed seclusion: Brian Wilson, Peter Green, Emitt Rhodes…and Shuggie Otis. 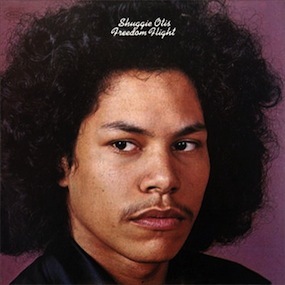 A year later the teenage prodigy released his first solo album, Here Comes Shuggie Otis, co-written and produced by his father and backed by the cream of Johnnie Sr’s session pals. The second followed a year later: its title Freedom Flight symbolized Shuggie’s breaking loose from his father’s patronage, with most compositions being credited to him alone and with a much smaller coterie of backing players, while Shuggie overdubbed his own bass and keyboard parts and wrote his own string and brass charts. But even this new level of creative control wasn’t enough: his third and final album, Inspiration Information, took three years to construct, with Shuggie playing everything bar the horns and strings which he scored. And then, at the age of 22, Shuggie Otis went into self-imposed retirement. Apart from occasional studio sessions for other artists and, recently, some low-key live appearances in Northern California, he’s remained silent and invisible. The first album is an enthusiastic freshman romp through blues and funk, showcasing Shuggies’s youthfully exuberant guitar; the last is an introspective, sensitive effort that unites soul and jazz in what would now be called ambient soundscapes, way ahead of its time but with a curiously vulnerable, unfinished quality. Freedom Flight is undoubtedly his most-realized collection. The blues/funk axis carries over from Here Comes, notably on the killer opener “Ice Cold Daydream” and the sole cover, Gene Barge’s “Me And My Woman”, but with a far more mature, considered approach to his guitar playing from the eighteen-year-old virtuoso. The album also nods in other directions; the gorgeous psychedelically-tinged California soul of “Strawberry Letter 23” with its astonishing coda, the restrained modal slide guitar work on “Sweet Thang” and the guitar/flute dialogue that ends the joyous “Someone’s Always Singing”. But the big surprise is the title track, which moves unexpectedly into the most melodic of free jazz with the guitar improvising against tenor sax, Fender Rhodes and a ubiquitous wind chime for thirteen minutes, and not a wasted note anywhere — Shuggie’s absolute masterpiece. This points toward the third album, and the direction he’d probably have taken thereafter had he stayed the course. Thanks for the post. One of the great records of the 70s for sure. But in your opening paragraph, why do you lump Jeff Buckley in with Kurt and Nick? Jeff wasn’t a suicide (and Nick’s suicide has been questioned). Jeff’s death was an accidental drowning. Maybe you meant to write TIM Buckley? Yea, Jeff Buckley drowned. And Re: Hendrix, I wouldn’t really call choking on your own vomit a misadventure. Love Shuggie though. One of my favorite mustached album covers of all-time, right up there with Prince’s self-titled second album. @G,@Matt – re: Jeff -agreed/removed. i think author may have meant Tim’s accidental heroin OD(?). One of my favorite records. Great write up. Great write up to a great album, we play a lot of Shuggie on the show. Sharon Jones has an awesome cover of Inspiration Information that’s worth checking out too. Nick Drake likely died from an accidental combination of medications. Yes he was depressed and was taking anti-depressants, but he certainly did not commit suicide because he could not handle success. In fact he was toiling in obscurity at the time of his death with both popular and financial success eluding him. It is an egregious distortion of facts to mention him in the same breath as kurt cobain. Thanks for the post. @Mike While family members and some others tend to think that it was an accident, this is an admitted optimism or “hope” as it were on their part. It was deemed a suicide by the coroner. But there’s really no way to tell, since it’s difficult to surmise what happens in those cases. So, you can’t say he “certainly did not commit suicide” when the coroner certainly said otherwise, and even the family members don’t certainly know themselves. And in any case, he was an extremely depressive person who for the most part was checked out of life anyhow, with few interpersonal relationships and a certain emotional distance from most of the people closest to him. So, while Kurt Cobain may not have adhered to the Nick Drake Template of Death, I don’t think it’s an egregious distortion of facts to mention him in the same breath. Both were troubled souls who had seemed to have a hard time finding agreement between who they were and their place in the world. Shuggie Otis is the truth! I first learned of Mr. Otis via Quest Love of The Roots. I instantly went out and found his album at Tower Records (which Atlanta no longer has). I bought the only copy they had…lucky me! Funny how everybody thinks Shuggie threw it all away.Not the case at all.He simply didn’t like the way the music business was and is run.He didn’t have the internet back in 1975.It was either do it this way or take the highway.The beauty of all of this is the man is still alive.He didnt turn into a dope addict or a drunk.There are a lot of people out there with talent that want nothing to do with something that is wrong.Think about that next time you don’t have your facts straight.